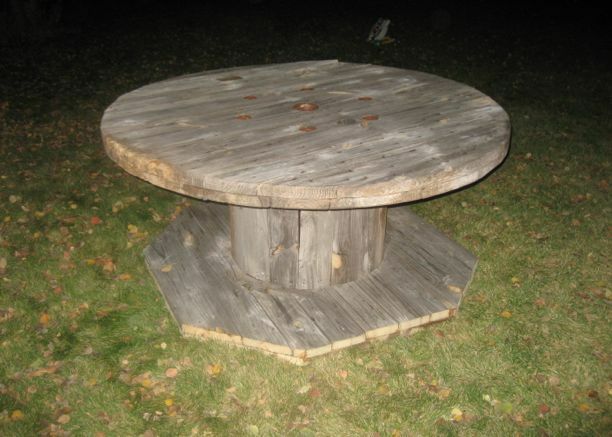 I haven't posted about it yet, but I've been keeping my eye out for a new dining room table. It's pretty cramped eating at our table right now. Add some dinner guests, plus another baby soon? Pretty darn uncomfortable! I looked at ksl.com daily for quite awhile, hoping to find a large queen anne style table that could sit 10-12 people ... I was thinking of maybe painting it aqua? But, over the last couple of months I decided that we needed something more rustic and natural in that room, and I gave up looking because I wasn't seeing anything that was coming even close. 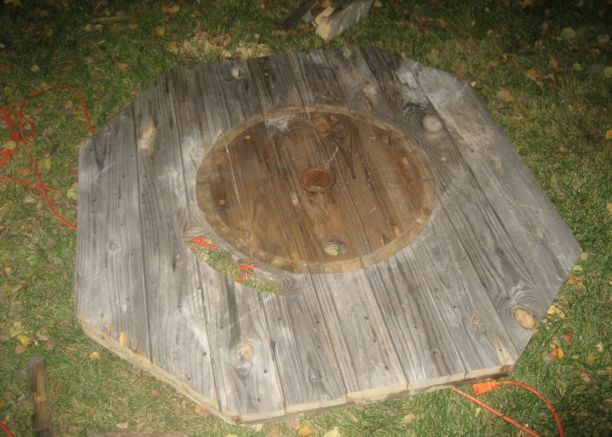 So, when Woo found this giant wooden spool, and wanted to make a dining table out of it, I was more than willing to have him try. 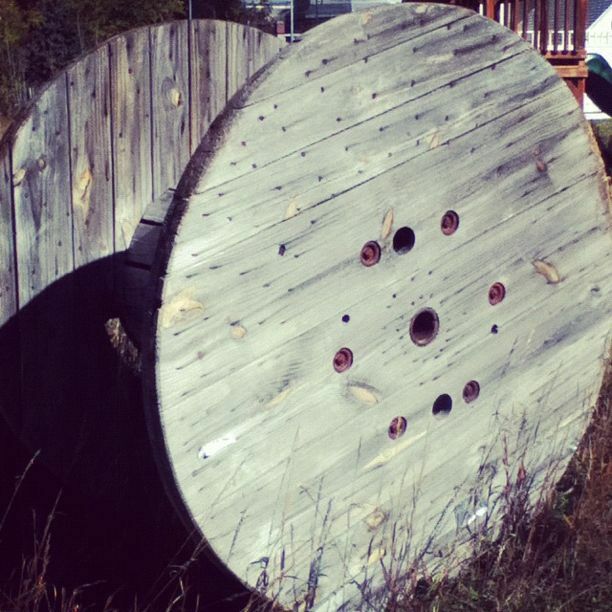 The spool is 65" in diameter, which is huge, but it was also over 40" high, which is way too high for a dining table. We also wanted to be able to scoot our chairs in, so the base had to be trimmed. 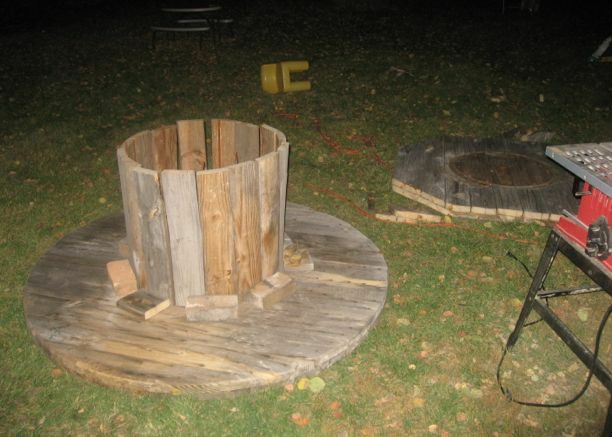 Woo took the whole thing apart (cutting through metal dowels and wood in the middle), made a quick run back up the road to remove 6 metal dowels from spools that were the right height (30"). Threaded the dowels through their holes and set the wood slates up in the groove of the top piece, and then came the tricky part. There have been a few times in the last couple of years, when I have thought that the job to be done is just impossible, and then Woo totally surprises me, and does it. This was one of those times. We got the base on top, and I sat in a chair balancing the base, while Woo worked his magic getting all the slates fitted in the top and bottom grooves, and the dowls fitted through the top holes. He tightened all the nuts and this table is very, very sturdy. It's just waiting for a few coats of poly from me, and I'll have some totally finished images for you soon!